Bonnie Million is the field manager for the BLM Anchorage office, which manages 13.5 million acres of public land within the planning area. She says uses for the land in question have changed drastically since the mid-1980s, when the management plan was last updated. The original plans for the area are the 1986 Central Yukon management plan and 1981 Southwest management plan. 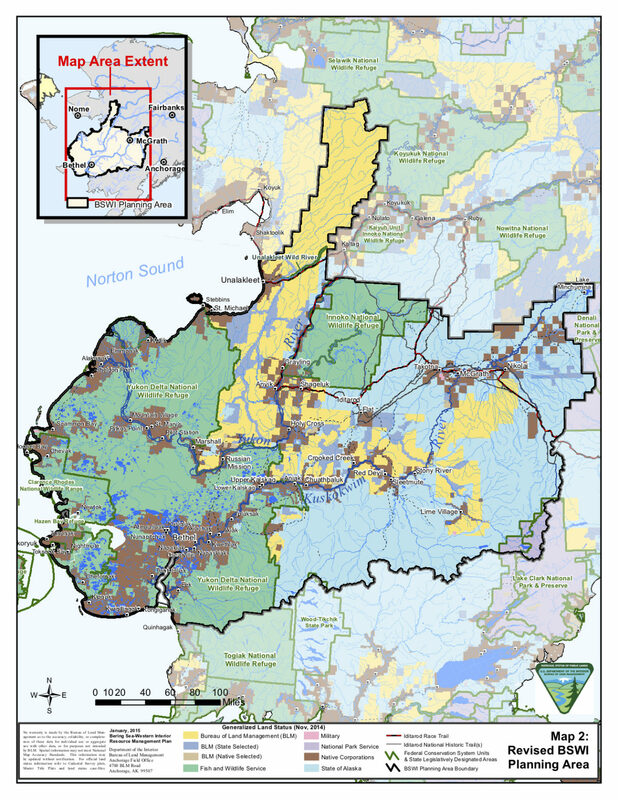 There are about 70 tribes within the area, but Million reiterates that the Bering Sea-Western Interior plan will not apply to land owned by Native Corporations (ANCSA groups). Million frames the BLM’s goal for the management plan as one focused on multiple uses — and sustained yield for all of the affected area. Right now, there are four options included in the draft plan, which is based on public input gathered from 2013 onwards. One of those alternatives is to take no action, which Million says is standard for BLM plans, while the other three make changes of some kind. Million says the BLM and the majority of public comments have favored a plan in the middle, between extreme conservation of resources and extreme development of resources. This alternative also involves lifting all public land orders (PLOs), which cover almost the entire planning area, according to Million. She says PLOs prohibit BLM from conveying land to State of Alaska, so removing them could allow that land to be open for other uses. Public comment on the Bering Sea-Western Interior draft plan is being accepted through June 13. Million says a summary of all public comments received will be used to determine which alternative plan is best, and then edit the final Environmental Impact Statement (EIS) as needed. Communities like Holy Cross, Unalakleet, and Aniak will be able to give their comments in person during BLM’s scheduled public meetings later this month.